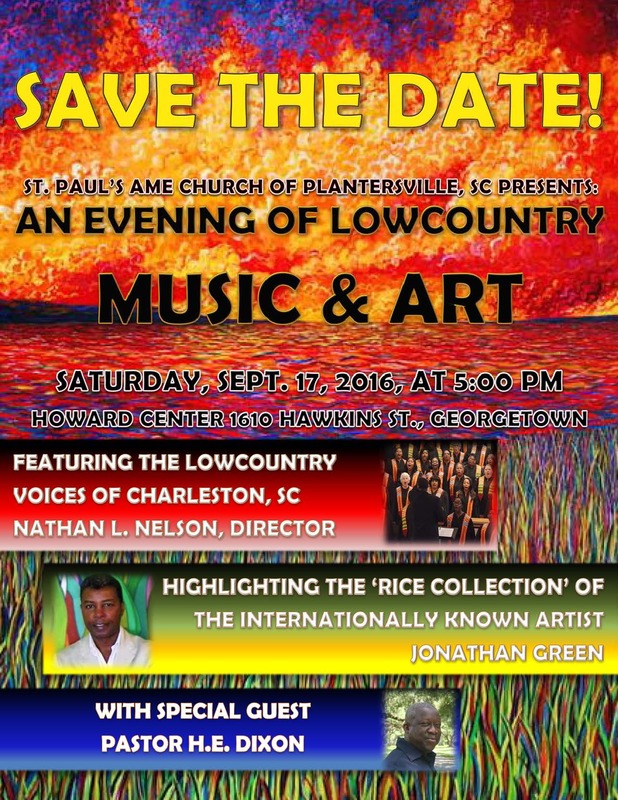 On Saturday, September 17th, the widely acclaimed Lowcountry Voices, under the dynamic music director, Nathan L. Nelson, will travel to Georgetown to present a concert featuring the paintings of the Rice Collection produced by internationally known artist, Jonathan Green. Jonathan Green is one of the most significant artists of the Lowcountry experience and his works reflect an intrinsic sense of history in the South – especially South Carolina. His paintings can be seen ALL OVER South Carolina, the Southeast, and the entire nation as many tourists when traveling through the Lowcountry, purchase something from the Jonathan Green Collection. Lowcountry Voices is the featured choir for the concert that will highlight various paintings through music depicting the experience of the Rice culture in the Lowcountry. A multicultural and ethnically diverse choir, LCV performs standard choral repertoire with special emphasis on African- American musical traditions. Formed in 2012 by Music Director, Nathan L. Nelson, with the assistance of Sandra Barnhardt, Assistant Director, the new choral group was quickly embraced by the North Charleston, SC Cultural Arts Department. Now entering its fifth season, the choir maintains a robust performance schedule locally and regionally. LCV has sung in New York, New Jersey, and Atlanta. During the 2015-2016 season, the choir was invited to sing at the Homegoing services for the Reverend Senator Clementa Pinckney, performed live at the Colonial Arena in Columbia with the iconic James Taylor, performed in New York at a Global International Conference held at Lincoln Center, performed during the Opening Week for the Re-opening of the new Gaillard Center, and was the featured choir at the Inauguration of Charleston’s new mayor, the Honorable John Tecklenburg. In July, 2015, a small ensemble of LCV singers carried the Lowcountry sound to Bermuda, and the choir is planning another international tour in 2017. Nathan L. Nelson, Music Director, is a native Charlestonian and has been involved in performing and directing since his early years. By the age of thirteen, he was organizing and directing local gospel and school choirs and his musical career was underway. In 2012, he organized Lowcountry Voices and continues to pursue his passion for preserving the cultural legacy and authenticity of African-American music as it was nurtured and performed in the SC Lowcountry. A special guest appearance will be made by the well known SC gospel artist, Pastor Henry E. Dixon, famous for his renditions of gospel music in the tradition of the Lowcountry, as well as for his in depth knowledge of the Rice culture. The concert will be held at the Howard Center, 1610 Hawkins Street, Georgetown, at 5PM with doors opening at 4PM. Tickets are $10./General Admission, and $30./Meet and Greet Reception with Jonathan Green from 4PM-4:45PM. Vendors will be available in the lobby before and after the concert with items available for purchase such as Sweet grass baskets, authentic African wear and accessories from Ghana, and the Jonathan Green Collection of cards, prints, and paintings, and much more.